Cut the beef into thin strips about 5cm long. Mix the flour with seasoning and toss the steak in the flour to lightly coat. Heat the oil and butter in a large non-stick frying pan until foaming and add the shallots. 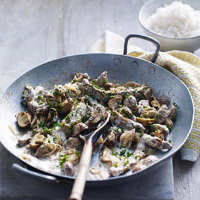 Cook over a low heat for 3–4 minutes until softened then add the mushrooms and cook over a high heat for a minute. Remove from the pan with a slotted spoon. Add the beef to the pan and cook for a couple of minutes until lightly browned. Pour over the brandy and flame with a match. When the flames die down add the mustard and return the shallots and mushrooms. Stir for 3–4 minutes until the beef is almost cooked through, but still a little pink. Remove from the heat then stir in the soured cream and allow to gently heat through, taking care not to bring to the boil or the cream will split and separate. Garnish with the parsley and serve with steamed rice or noodles. simmering and stir in the soured cream as above.